Jordan is home to some incredible artistic talent. And Mara at 225 Water Street has got to be one of our greatest treasures. She is a photographer, graphic artist, and mosaic tile artist and author (and more…). I first sought her out when she moved to Jordan because of her graphic artist abilities – to turn my historic Downtown Jordan walking tour into something beautiful (and she did!). But we became friends over tile. She even saved me when I took on the ridiculously naive first-tile-project fireplace. After I was done with the fireplace, I took my first tile class from Mara, so I’d know what I was suppose to be doing. So now when I (or someone else in my house) breaks a beloved heirloom (or a discontinued china plate), I think of it as a tiling opportunity rather than as a moment to scream. Secretly, I have a few pieces I hope will fall into a million pieces and move on to a new life. So when one of my past-favorite doll statues didn’t sell at the garage sale, I drove around with her in my car after saving her from the after-the-garage-sale-Goodwill-drop-off. And she broke. So she stayed in my car until I brought her to Mara’s, to add to her private cabinet of cast-offs waiting for a new life. She wasn’t named Matilda then. On one of my Saturdays when I walk around downtown Jordan to catch up with the locals, I made my usual stop at Mara’s. And she had just finished gluing the most beautiful mirror I had ever seen. Full of birds and flowers and little china dishes. I loved the birds, they reminded me of my Grandma’s porcelian bird collection (I think I still have a few I inherited packed away somewhere). And the flowers were like my favorite Capodimonte flower candlesticks I received from a friend in California. I was mesmorized, captivated. And as I looked around the mirror I found her, my broken porcelian doll. Mara hadn’t remembered where she came from, but had named her Matilda. My Matilda! Mara’s store and studio is an amazing place. A respite. An inspiration. And she is an amazing talent and an amazing person. Someone you’ll surely want to meet, someplace you’ll surely want to visit, when you come to Jordan. The crystals have been returned to the Arbor we purchased at the 2007 Jordan Art Festival! Greeting you as you enter the courtyard garden, the crystals send rainbow lights dancing through the gardens. When we first brought the arbor into the courtyard, we didn’t have it anchored down. Strong wind blowing through the courtyard would knock down the arbor and crystals would be lost in the plants. I recovered as many as I could, they were said to come from an antique chandelier from New York, but I’ve had to add several new crystals found on eBay. It’s so beautiful having it restored to it’s former grandeur. And speaking of the Art Festival – the 6th Annual Jordan Art Festival is coming up this weekend, June 20 & 21. Both Saturday and Sunday there will be Artist Demonstrations in oil painting, watercolor, wheel-thrown pottery and more. The Ambrose Freedman Log Cabin will be open for tours by Myrna Pekarna, and then stop over at Pekarna’s Meat Market next door for some of the best ribs, sausages, and blue cheese you’ll ever find! Across the street Maureen Carlson, our Jordan resident polymer clay artist, will be presenting her Storyclay (TM) Telling at 1:00 each day. And don’t miss the Recycled Art Contest III entries and winners on display in the courtyard at 225 Water Street. Past contest entries have been extremely creative, so be sure to check it out! The Jordan Art Festival is just one part of the 2009 Jordan Summer Celebration. 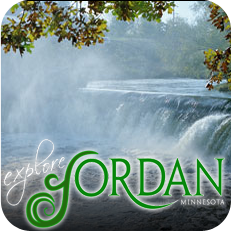 In Lagoon Park check out “Pork In The Park” sponsored by the Jordan Jaycees. There will be food vendors – featuring pork sandwiches – plus craft vendors and performers in the bandshell. And on Saturday morning, the 6th Annual Jordan Valley Bike Tour featuring 12, 20, 35 and 60 mile rides leaves from the Mini Met Stadium. And if you need a place to stay, we still have some rooms available at our Bed & Breakfast for each night of the Art Festival. You’ll be just a few shorts steps away from all of the festivities! The Historic Jordan Water Street Merchant’s through ExploreJordan.org presented a Girl’s Night Out on May 15th. With help from Sarah Hansen (Tilly Evan Jones’ daughter, our local Palm Reader), we presented our Tea & Tile events. Though it rained, and we moved the event from the courtyard garden indoors, we had a great turnout. We served Lavender & Lime Tea and pastries in the formal dining room, and had tiling in the kitchen. Those who hang around Jordan for any time are sure to be inspired to glue shiny objects to other things by Jordan’s resident mosaic tile artist, Mara Wallach. Before I even knew what I was doing, I decided to tile the face of our antique fireplace mantle with VanGogh glass tiles. I have said many times over the years of renovating this building, it’s better that I don’t know what I’m doing before I take on a project, otherwise I may never have done it. Well, that fireplace was one of those! Mara came to my rescue during that project, and gave me, and our innsitter Cindy, a quick lesson in mosaic tiling, pointing out this was not the beginner’s project – but graciously rescued me with instructions the eve of Christmas Eve! After that I of course took her class, and created the welcome frame for our Guest Kitchen – a bit of a backwards introduction. Now I’m hooked. I next tiled the buffet table for our front porch, with Fleur-de-Lis pattern and red glass tiles. I’ve was inspired for this is the focal point of scones, cinnamon rolls and coffee during the Jordan parades marching in front of our porch on Memorial Day and Heimatfest – and so it has served. I’ve come to realize my engineering background keeps me more formal than abstract in my designs, but in the art world there is room for it all. So on to the project for Girl’s Night Out. In my past life in California, I painted porcelain pieces. I had an Ivy and Cherub theme going (not breaking from my formal “must-have-a-theme” mentality), and painted a clock and a vase – both of which had been broken by my cats from my past life in Prior Lake. So, I’ve moved on from the ivy theme – loved the pieces – but were repaired yet broken beyond display. The perfect mosaic tile medium. So during a very rainy garage sale day, I proceeded to break the clock, the vase, and several complimentary vases and plates. Ready for a new piece! Sacrificing the wood destined for a tabletop of shells and sand collected from our spring break trips down south, I glued the foundation pieces of the California clocks and vases and let the girls have at it! It was great fun. Some were enthusiastic and were gluing naturals, others a bit intimidated but I think were set free with the gluing process. It’s addicting! It all wasn’t finished that night, but over the next couple of days I glued in a frenzy as I’ve never done on a project – it was complete within a week! All that is left is finding clock hands big enough to do the 2-foot clock justice (eBay here I come). The clock is already hanging on the back porch in the courtyard, patiently awaiting her tell-time handles. What do you think??? I wish I photographed the separate pieces before the clock project. But for my next project – my long awaited reclamation of the bird bath – I did capture where I started. It’s the project of the month now! Watch for updates, and the history behind the pieces getting glued. For me, I guess, it just all has to have some meaning, and these pieces have some for me.